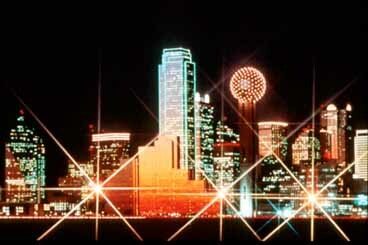 Dallas has grown from a tiny trading post on the frontier in 1841 to the most popular destination in Texas and the eighth largest city in the United States. Home to several Fortune 500 companies, over 600 high tech companies and six professional sports teams, visitors can enjoy modern attractions amid the downtown skyscrapers, attend one of the many professional sporting events as well as visit Old West attractions in this very popular destination area. The birthplace of the frozen margarita and the chicken fajita, tourists should make it a point to sample local Tex-Mex specialties while visiting this great city in the southwest. the Dallas Stars of the National Hockey League and the Dallas Sidekicks of the Major Indoor Soccer League. The Dallas Cowboys of the NFL play football in Texas Stadium located 10 miles west of Dallas in Irving. The Texas Rangers play major league baseball in The Ballpark in Arlington about 15 miles west of Dallas. NASCAR racing can be seen at the Texas Motor Speedway north of Forth Worth. Two professional golf tournaments are held in the Dallas-Fort Worth area every May. Museum, which explores the assassination of JFK in Dallas on November 22, 1963. The museum is located on the top floor of the old Texas School Book Depository Building where Lee Harvey Oswald is supposed to have fired his fatal shots. The JFK Memorial and the Conspiracy Museum are also located nearby. A few blocks north of Dealey Plaza is the West End Historic District. 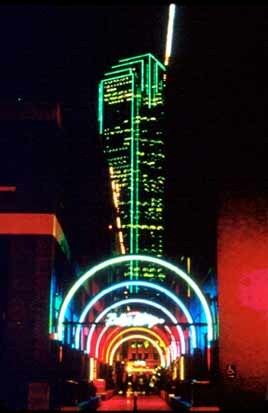 Tourists can visit the more than 100 shops, restaurants, galleries, nightclubs and attractions here including Dallas Alley, an entertainment complex, and the Dallas World Aquarium. skyscrapers. The Dallas Museum of Art, the Morton H. Meyerson Symphony Center and the Dallas Theater Center are some of the many cultural attractions located in the Arts District. Fair Park, located 2 miles southeast of downtown, is home to eight museums, the Cotton Bowl and the largest collection of Art Deco Buildings in the United States. 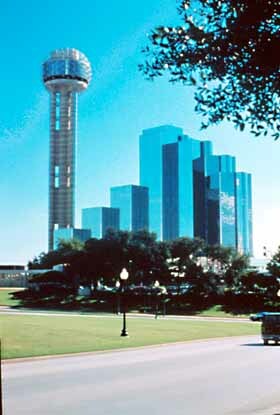 The Dallas Zoo is located 3 miles south of downtown. Texas to tour his television family's Southfork Ranch, the most famous ranch in the world. If you want to see real cowboys, drive 35 miles west from downtown Dallas to Fort Worth, a city that flaunts its Old West heritage. Also called "Cowtown," Forth Worth was the last major stop on the old Chisholm Trail where the cattle trade made Fort Worth a major city.